A new study presents some alarming findings for older moms' cardiovascular risk later in life, namely stroke and heart attack, but here's what you can do about it. The growing availability of fertility treatments means that women can get pregnant as their natural biological clock is winding down. But pregnancy at a later age can come with increased risks for baby, such as Down Syndrome, owing to mom's older eggs. And now new research presented at the American Stroke Association's International Stroke Conference 2016 leads to worrisome risks for mom as well—even after pregnancy is long over. The study found that having a baby over 40 is associated with an increased chance of stroke and heart attack later in life. Researchers looked at data from over 72,000 women aged 50 to 79 over a 12 year period. They compared the rates of stroke, heart attack and death from cardiovascular disease among the 4.6 percent of women who had been pregnant over 40, with those of women who had children at an earlier age. The moms who had babies later in life had increased risks—specifically, the rate of ischemic stroke (caused by a clot, the most common type of stroke) went from 2.4 to 3.8 percent, hemorrhagic stroke (caused by a brain bleed) from .5 to one percent, heart attack from 2.5 percent to three percent, and cardiovascular death from 2.3 to 3.9 percent. "It is well known that women who are pregnant at the age of 40 years or greater have a higher risk of developing complications during and immediately after pregnancy," study author Adnan Qureshi, M.D., lead researcher and director of the Zeenat Qureshi Stroke Institute in St. Cloud, Minn., tells Fit Pregnancy. "The current study suggests that there may be long-term consequences as well." Dr. Qureshi and his colleagues figured out that most of the known risk factors for cardiovascular disease, such as high blood pressure, diabetes and high cholesterol, were responsible for most of the cases among the older moms. But why would pregnancy over 40 lead to such risk factors in the first place? 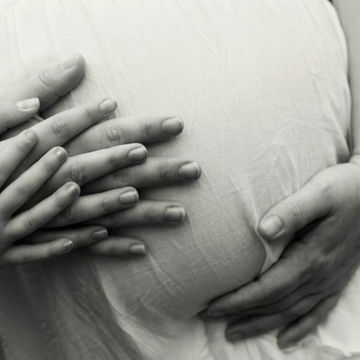 "Pregnancy leads to several physiological changes in the body for women," Dr. Qureshi says. Mom's heart and blood vessels are subject to strain as her volume of blood increases to supply both herself and her baby. "The ability to tolerate such physiological changes and additional cardiovascular workload decreases with increased age. Therefore, cardiovascular dysfunction is more likely to manifest." So, pregnancy can leave its mark long after a woman has given birth. "Women who have the last pregnancy at an advanced age have a higher risk of developing hypertension [high blood pressure], hypertension-related disorders, and diabetes mellitus during pregnancy [gestational diabetes]," he says. "There is some evidence that disproportionately higher rates of cardiovascular risk factors continue years after the pregnancy." But, one cardiovascular event did not seem to be linked to any of the risk factors: Hemorrhagic stroke, which is caused by a brain bleed and makes up about 13 percent of strokes. Dr. Qureshi has some theories why pregnancy seemed so directly linked to this kind of stroke. "Perhaps there are unknown medical conditions triggered during pregnancy at advanced age," he says. "These changes continue to progress without being clinically evident until years later, manifesting as a hemorrhagic stroke." More research is needed to uncover the specific relationship between pregnancy and this type of stroke. If you are over 40 and pregnant, is there anything you can do now to lessen your chance of these negative health outcomes? "It still remains unclear whether women who become pregnant at the age of 40 years or greater can modify or reduce the risk in later life," Dr. Qureshi says. But, it makes sense to do everything you can to avoid complications like gestational diabetes and high blood pressure, so eat a healthy diet, exercise (with your doctor's OK) and keep your weight gain in check. Later on after pregnancy, awareness of your increased risk for cardiovascular disease can help you and your doctor look out for signs of it. Plus, it will be even more important to maintain a healthy lifestyle as you age. "Regular screening and risk factor modification in a more rigorous manner may be a logical step," Dr. Qureshi says. Even with the increased risks, Dr. Qureshi stops short of saying that women over 40 shouldn't get pregnant—just that they should be more informed of the potential effects later on. "The choice to become pregnant at age of 40 years or greater is an individual choice for women," he says. "The study simply provides additional information regarding long-term consequences that women need to take into account at the time of decision making."